CREATING CUSTOM COMMISSIONS FOR YOU! I happily welcome collaborations in the creative process of designing a work of wearable art just for you! Together we can develop a design – whether it be a pendant or bracelet – whether it be sterling silver or 100% copper or a combination of both – and select focal point stone(s) and accents. I appreciate the words of Candy McHone Rowe, a long-time collector of my work who says: “Every new creation is better than the last. Fantastic talent shining bright.” Last month I shared a number of heart pendants – many were commissioned – and here are works of wearable art created with a special feeling. My friend Valerie in Augusta, KS has such a kind heart! She has been commissioning me to create pieces to celebrate her beloved horses and the above sterling silver and copper hinged bracelet is titled “For The Love Of Caleb.” Valerie chose the stone: a Carico Lake Turquoise that comes from a private turquoise mine outside of Battle Mountain, NV and was shaped by Jason Brousseau, NM. 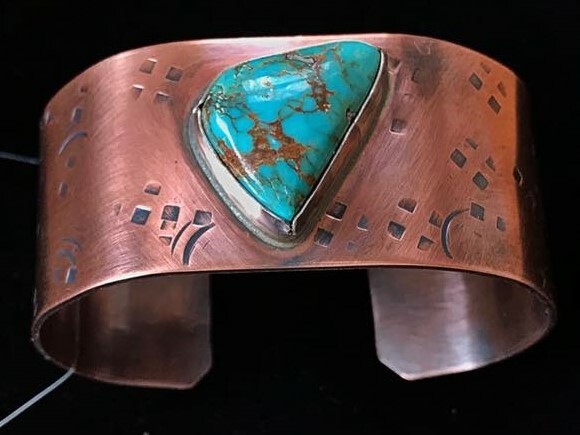 This copper cuff was commissioned by Dave from Lovelock, NV with the intention to help soothe his arthritis. I added a turquoise stone, to encourage healing. My facebook followers liked this idea too: Marlene Sabatina Good energy in that one! Judy Vaughn Very nice…gorgeous yet manly. Cyndi Dan Wolke Beautiful. How wonderful of you to help him. Your beautiful gift should lift his spirits. I always appreciate the confidence invested in me. These pendants feature treasures sent by a collector in La Grand, OR who commissioned me to create gifts for her family with stones cut by her father. Worn by a well-loved father, I converted these cufflinks into earrings for Chris in Nevada who trusted me with these memorable treasures. “STIRRUP” is a collaborative piece designed by Billie Morken into which I suspended a Blue Mountain Jasper within a sterling silver and copper stirrup shape. 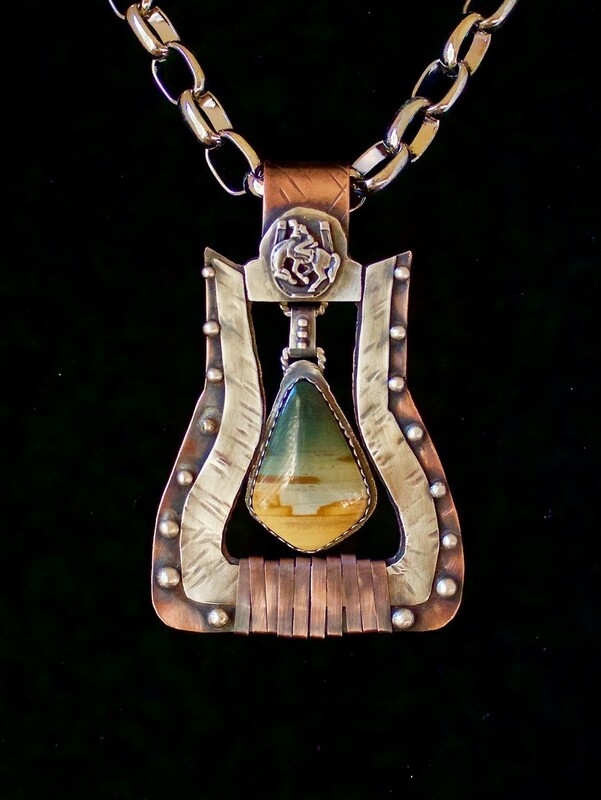 An important work of wearable art – the pendant measures 5” high and 3½ wide – it received the following accolades: Fronnie Bealer This piece beautifully showcases the stirrup as, not only a very useful tool, but how big a part it played in the development of the west. Jessie Heinrichs Trying to come up with something I want you to do for me.. you make it tough only because all are Soooo beautiful. Judy Vaughn This piece whispers " saddle up". An intricate commission “The Path To The Unknown” sterling silver and copper pendant features as focal point Dead Camel Jasper from the Dead Camel Mountains outside of Carson City, NV – stone shaped by Paul Forsythe, Gilroy CA. In town for the 2019 Barrett-Jackson Scottsdale Auction, Nancy and Hutch from Superior, Wisconsin came by my studio with a photo of their ’32 Ford Roadster. I fulfilled this unusual commission request by creating a replica of the car’s grill – appropriately set with a piece of Fordite stone. 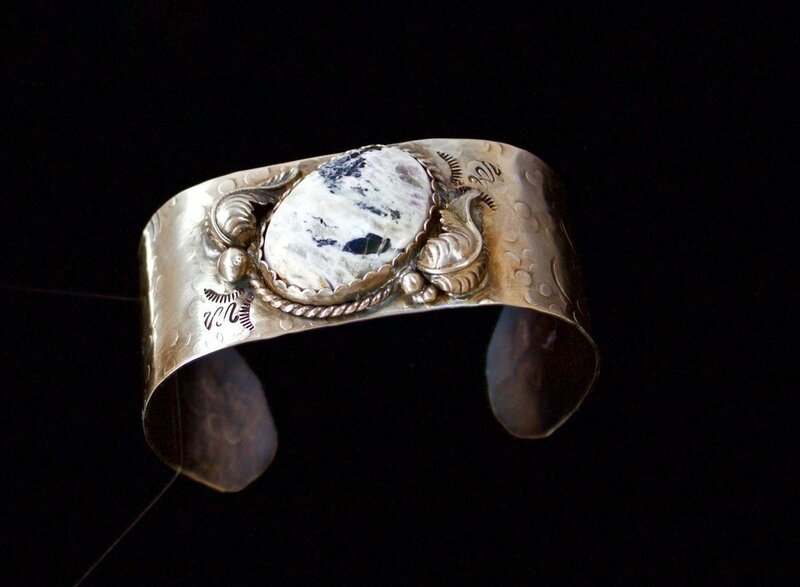 This sterling silver bracelet with a remarkable White Buffalo centerpiece stone was a commissioned birthday present from husband to wife. Designed with a Dead Camel Jasper cut by Odie House, Tucson, AZ, this sterling silver and copper piece was a Christmas commission going to Greeley, Kansas. The pendant is accented with barbed wire and a sterling silver horse cast in France. If I can design something for you just private message me on facebook www.facebook.com/HighDesertCreations or contact me via email kathi89445@yahoo.com or call 775-304-6756.